We’d love your help. Let us know what’s wrong with this preview of Mastering Nginx by Dimitri Aivaliotis. To ask other readers questions about Mastering Nginx, please sign up. Какая-то невнятная смесь из мануала и простого перечисления директив конфигурационного файла. A pretty solid gathering of widely used nginx modules with their descriptions. As one would probably guess, this is NOT a comprehensive documentation of nginx. While quite a few times I had to read some sentences for a few times, and after that open up the official nginx documentation because some things were glanced over, I can say I was mostly satisfied by the content. The commented configuration examples were welcome and the few guides like "Converting Apache rewrite rules to nginx" were also A pretty solid gathering of widely used nginx modules with their descriptions. As one would probably guess, this is NOT a comprehensive documentation of nginx. While quite a few times I had to read some sentences for a few times, and after that open up the official nginx documentation because some things were glanced over, I can say I was mostly satisfied by the content. The commented configuration examples were welcome and the few guides like "Converting Apache rewrite rules to nginx" were also a nice touch. There was even an example of a debug log with commentaries. This unfortunately was (I think) the only place where nginx phases were mentioned. 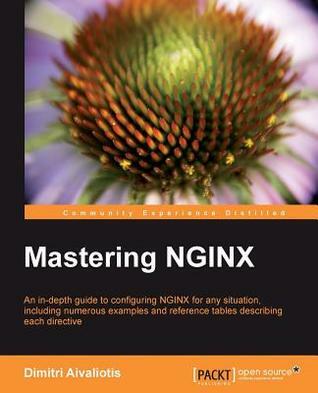 A pretty straightforward book to learn Nginx. My knowledge of Nginx is zero before reading this book but this book has increases my knowledge and understanding about Nginx because it is easy to read and very detailed. It provides various types of scripts, examples and scenarios with the descriptive explanations as well. I will keep this book for my future reference in case I need it. Книга на треть состоит из перечня директив и их описания, но есть и несколько полезных use-case'ов. Например, как настраивать SSL, балансировку, роутить запросы, кэшировать бекенды и использовать модули. Excellent level of information on Nginx and the most used modules with their descriptions. I'd recommend that you keep right beside you desk, just in case.